... atached two photos where i cutted black plastic foil with 1 Watt power at 500mm/min for testing the min-limits and with 2 Watts for a clean cut. The carved tray in the first image is 0.25mm wide, the holes were melted at the start/end of lines and curves, where the moving speed was a bit slower. The holes and through-cuts have a width of 0.28 to 0.3mm - for a thinner cut i need a much better optic and the material shouldn't be thermoplastic as this tend to melt around the laser spot and move away from the cut. 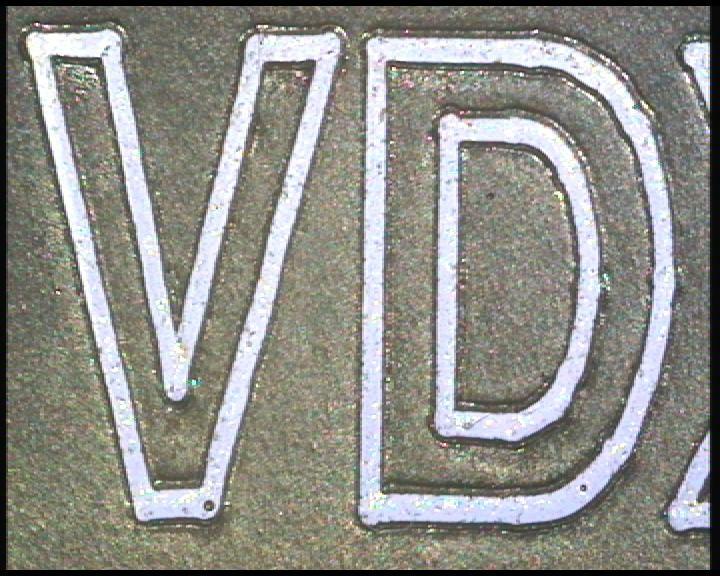 ... to compare i engraved the same material with the fiberlaser at 1Watt CW and a single focussing lens - so the spot was around 30 microns in diameter (with beamexpander the spot will be below 10 microns). 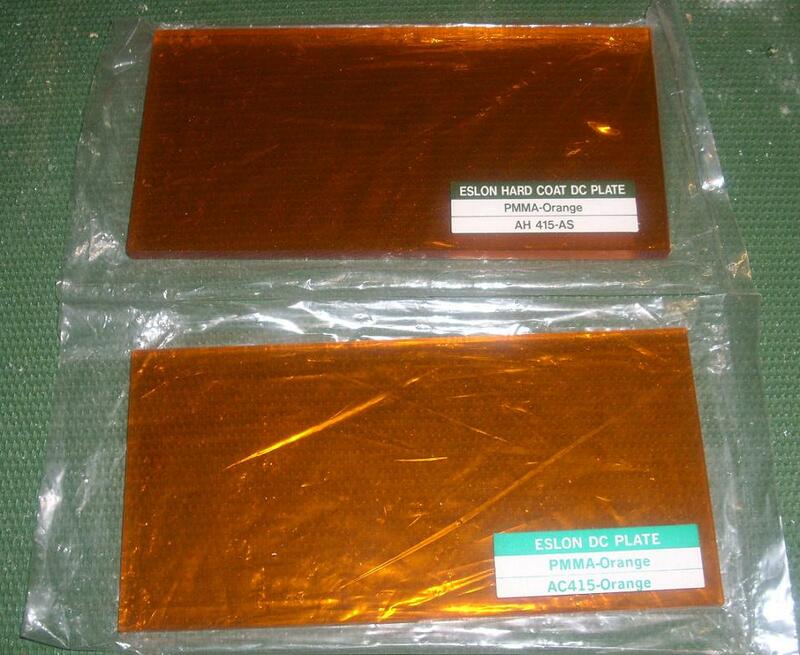 The trays have 2mm distance and measure between 40 and 80 microns in width. I think the surrounding material melts and retracts, so the molten tray is much wider than the original laserspot - with the diode this could be the same. So with CW-cutting you'll receive a melting area with a diameter of two times the laserspot. ... update - designed a driver-PCB with 5xLM317 and a switching MOSFET. For testing with SLS i've found and received two kg of lignin-powder from Tecnaro - as its dark brown and a natural thermoplast, this should be the ideal material for low-energy-SLS with the benefit of bio-degradability. i am bilding a laser cutter for my diploma. Which material (kind of mirror) is needed, and where to get it. ... you have seen the part "3.1. 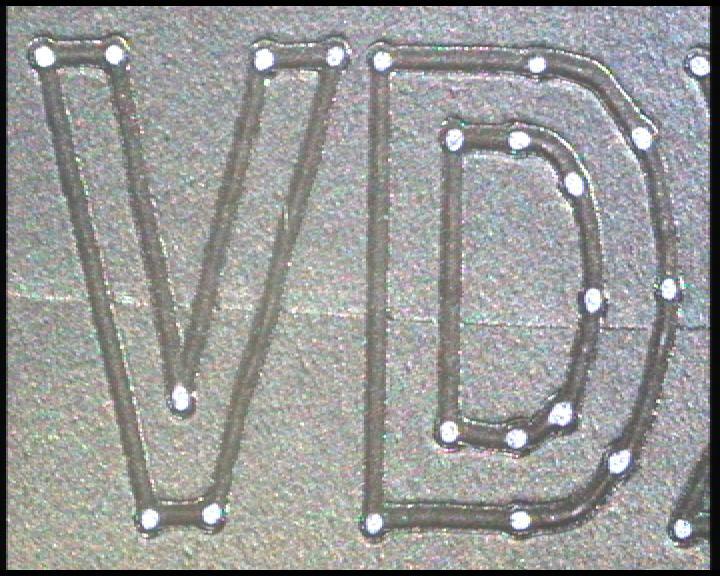 Embedding a Pilotlaser as guide or beam-indicator" in [objects.reprap.org] ? Which IR-wavelength will you use? 808nm and 975nm can pass 'normal' transparent materials, so you can use a glass-window scewed by 45 degrees and align/adjust both beams as shown in the image. The power was 2 Watts, spot diameter around 0.1mm (the thin lines are 0.08mm thick) ... and you can see the ugly residues of the glue, which wasn't evaporated, only slightly browned, so it stayed intact in the cutting groove. As you can see in the previous images, when cutting the same foil on a plastic surface, the glue was completelly evaporated too ... but with a ceramic (cooling) tile as surface, the energy of 2Watts wasn't enough to remove the glue. Edited 1 time(s). Last edit at 10/11/2010 04:42AM by VDX. I bought a 1W 808nm diode laser + housing with plastic lenses + protection goggles. I hope to have all of it in 2 weeks and so I will start making my tests. My target is to cut paper and if possible, etch PCB. have you tested your diode with white paper? 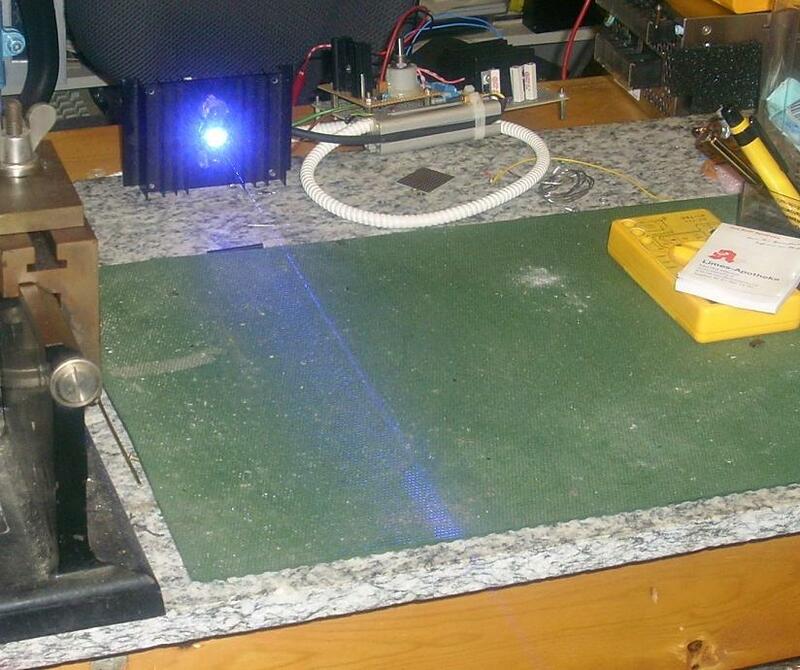 With the 975nm i have trouble to burn white paper even with 5Watts, but better results with 0.5Watts at 445nm (blue). Coloured or dark paper is no problem, so it's a matter of absorption (material colour) and energy density (focus diameter). For updating my (really slow ) progress: - i'm actually finishing two 'comercial' 5Watt-modules and will post some images later. When ready with the IR-modules and the old lathe i've bought from ebay, i'll make some tests with the blue 1W-laser burning/engraving different materials. > have you tested your diode with white paper? I don't have my diode and other parts yet. I just bought them from Ebay. > and will post some images later. I went for 808nm because seems the best price/wattage available. I'll recommend the 1W-445nm-diodes for low-power-laserworks ... they can be found for around 30€ (mostly salvaged from Casio-beamers), are really good (much too good maybe) visible ... and for goggles you can try with UV/blue-shielding PC-windows (bright orange in colour) commonly used for housings around photolithography and etching systems. So, for now I will test the 808nm. 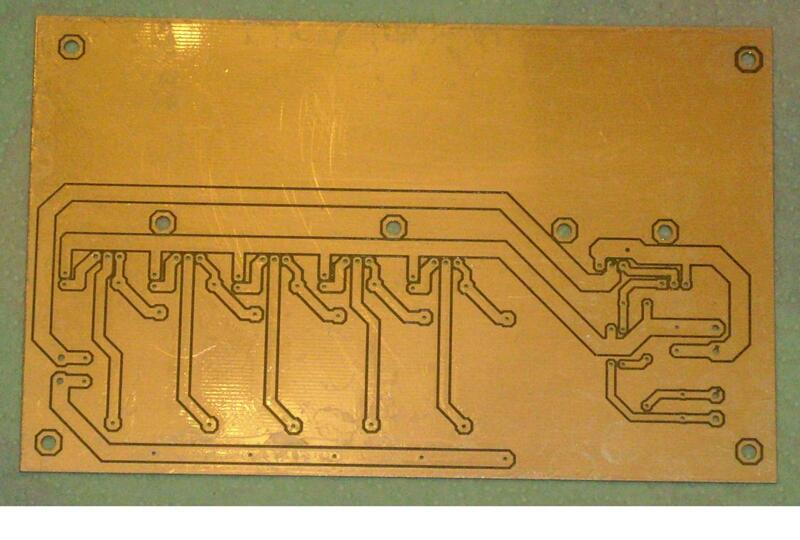 I am looking for PCB laser etching and mylar stencil cut. Do you know if with this [cgi.ebay.com] housing with plastic lenses I can get near to 0.1mm burning point/lines? higher, lower? this is a common collimator head, so could be good enough for 0.1mm focus. In most cases glass lenses are better than plastic, so if possible, use glass. If you cover the PCB's with black paint, there souldn't be a difference in absorption, so try best with dark or coloured materials. Edited 1 time(s). 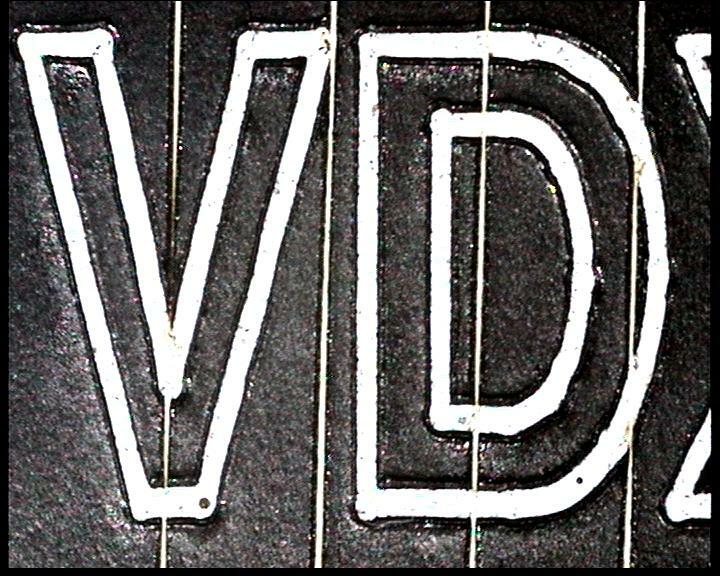 Last edit at 11/29/2010 04:25PM by VDX. > enough for 0.1mm focus. Ok, nice to know. I will try to measure it when I test it. I would love to 50um or 10um... but maybe I don't need for my application. > plastic, so if possible, use glass. > best with dark or coloured materials. So, my target application is for be able to prototype electronics, for 0.5mm pitch. Etching PCB using the black paint and laser, and laser cut mylar stencils for applying solder past to PCB. I wish I could do this with cheap (under $50) diodes/hardware. And what are your targets? So, I will need about 1.3A @ >2V. If I want full power all the time, how many LM317 should I use If I do not want to use cooling and running from 5V or 3.3V of PC power supply? Is there any typical circuit using some step-down IC which is relative cheap? maybe something we can control linear and not using steps like using LM317 in parallel? ... my targets are mainly cutting thin plastic foils and melting/sintering powders to solid tracks. 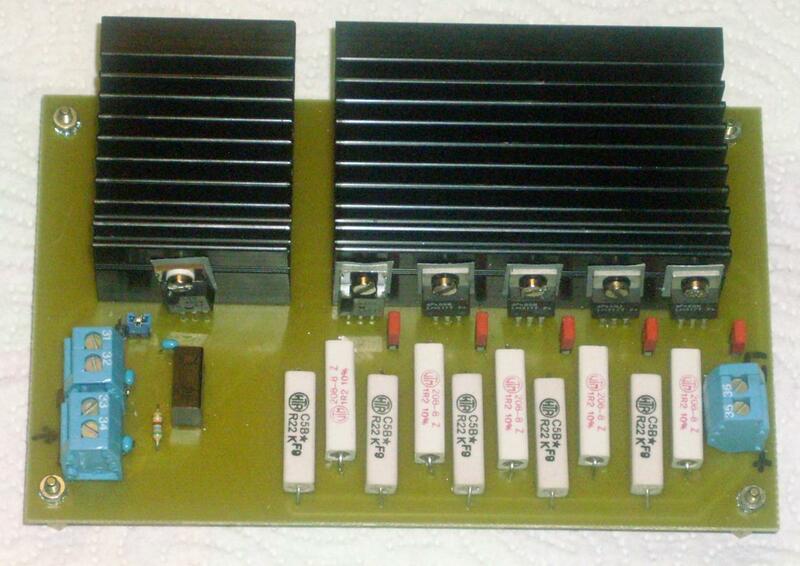 I'm started with the LM317 as current regulators because they are highly reliable and the PCB is totally simple. ... i've sold my first housed 5W-module - it's similar to the one in the last linked image with switches connected to the LM317-jumpers, so i can select max. oputput easy from 1Watt to 5Watt in 1W-steps. The power (6 to 8 Volts @ 6 Amps) is connected to the 4mm-jacks, PWM signal is connected to the BNC-terminal. Do you have a solution for that wattages and prices? I am developing my electronics and I would love to provide and sell a complete solution (mechanics, electronics, firmware and software), please contact me. for paper i'll recommend a 445nm-diode with 1Watt power - i've got one for 30 Euros and you'll find them in ebay too. They are 'bright-blue', so really good visbible and the wavelength is much better absorbed by organic material, so you'll be able to cut with 1 Watt blue directly focussed from the diode maybe even better than with 3Watt IR through the fiber. @Sebastien - we can discuss this there, but i'll prefer better giving tips and infos for DIY than selling laser-modules all over the world. > them in ebay too. > even better than with 3Watt IR through the fiber. I don't have problems with electronics, but I have difficult to find laser + lenses + knowledge/safety. I would love to have a complete solution, including goggles for safety. Actually i'm working on more efficient drivers and will receive two collimators for the 445nm-diodes in the next days, but i have only one of the blue diodes here, so not ready for selling. Do you know/have experience of some trust online shop? > Do you know/have experience of some trust online shop? ... not really - for unknown seller i'm checking for counts and ratings and sometimes the content/design of the offers. Most business laser-related is performed with users of specific (sometimes closed) forums, where we communicate in the posts and sometimes crosslinking to ebay auctions that are interesting or digged out occasionally. > content/design of the offers. > or digged out occasionally. Well, I guess that's a very high price that almost no one would buy it for paper and PCB etch. Who knows if maybe 500mW or 300mW laser is ok, and so relative cheap? 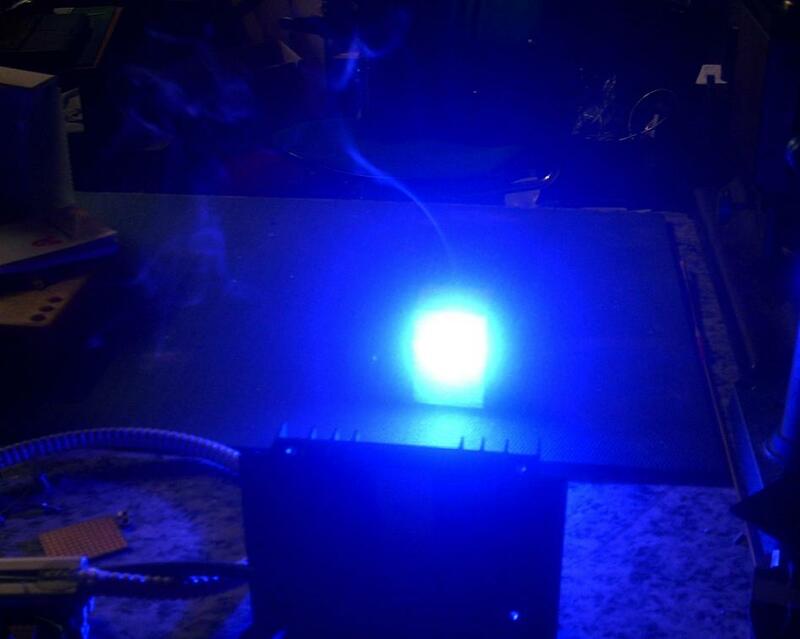 -- if my 300mW red laser can melt black tape, maybe a 300mW blue laser would "burn" black paint on PCB? ... try to find a blue diodelaser with [email protected] - they'll be sold occasionally around 40 Euros. > - they'll be sold occasionally around 40 Euros. Isn't easy for me to understand what you can provide me. I don't know how such lenses work. Are they needed? will they work with the diode I will get? If you have one 445nm-diode with 1Watt power, could you please take some pictures and record a video, showing what it can do/cut? -- I want to understand/have guaranties before buy. If there is anyone interested on working for a laser cutter/engraver, please look at that project. 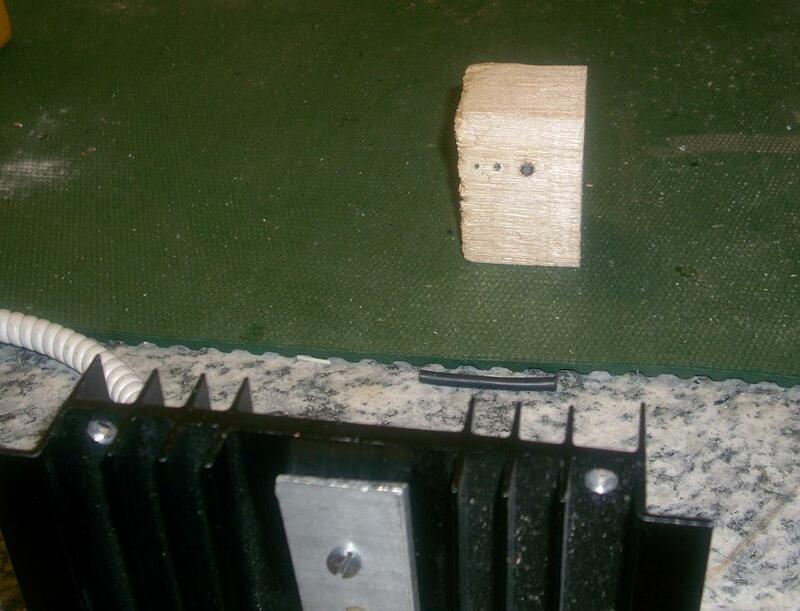 ... i'll reactivate the 445nm-diode with the prototype-head and take some photos the next days. I'm awaiting some collimators and lenses with AR-coatings for blue and red, this will be better to compare. For 808nm (or even 975nm) in the 'low-power' range below 10Watts you can use any optical lenses you have at hand - the reflection of some percents isn't critical and the lenses work as normal. I tested burning balsa (what's nearly impossible with 3Watts IR!) - the big spot on the right was burned nearly 5 seconds, the smaller in the middle around 2 seconds and the smallest on the left maybe 0.5 seconds.